We've included information below about some of our past and present dishes to help you waste time at work. Brussels sprouts tossed in Mexican bistek and served on a sizzling stone with iceberg lettuce wrappers and accompaniments so diners can make their own tiny bites that are one part Chinese sung choi bao and one part Mexican tacos. The accompaniments are usually: smoked avocado, pickled red onion, cotija cheese, radishes, crispy brussels sprout leaves, tortilla strips, pickled jalapenos, salsa verde, and crema. 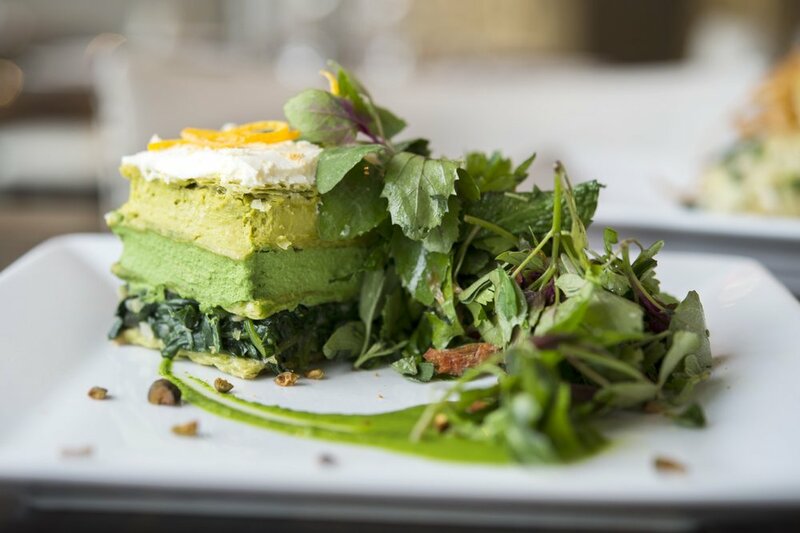 Spinach puff pastry layered with super-concentrated spinach mousse, smoked pistachio butter, and a lilac spinach, dehydrated grapefruit, and smoked pistacchio salad. 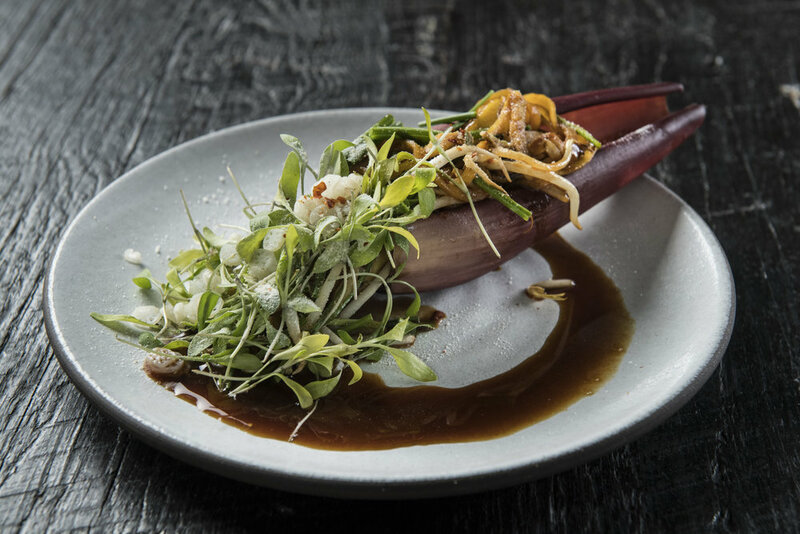 One of Dirt Candy’s signature dishes, portobello mousse has been on the menu since we opened in various versions. We serve its current incarnation with cherries, Asian pears, and tiny rounds of truffle toast. 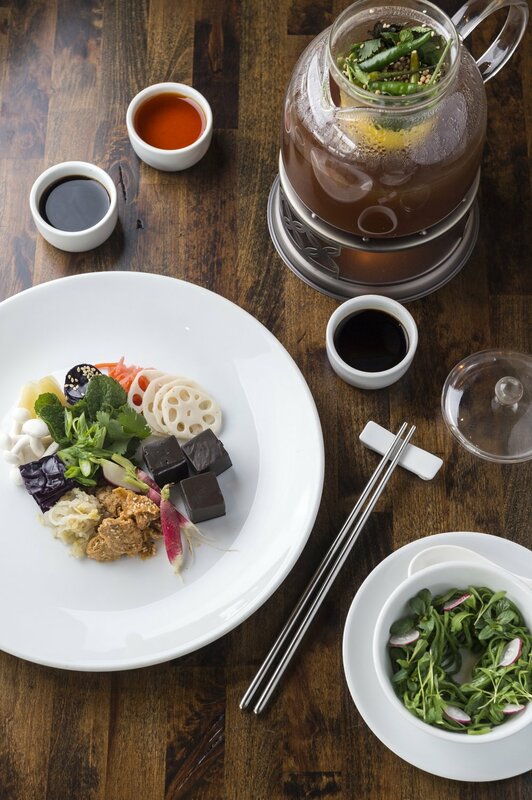 For two or more people, this is our version of Chinese hot pot. A kettle of smoked cabbage broth is served warm at the table, alongside a selection of sauces and accompaniments so you can create your own soup, however you want it. It comes with ramen noodles made of cabbage and kale, lotus root, ginger kimchi and spicy watermelon radish kimchi, pickled ginger, raw radishes, fresh cilantro and mint, sesame fu, grilled cabbage, sesame braised cabbage, homemade chili oil, black vinegar, and soy sauce. You'll never trash talk cabbage again after tasting how good it is in this hot pot. 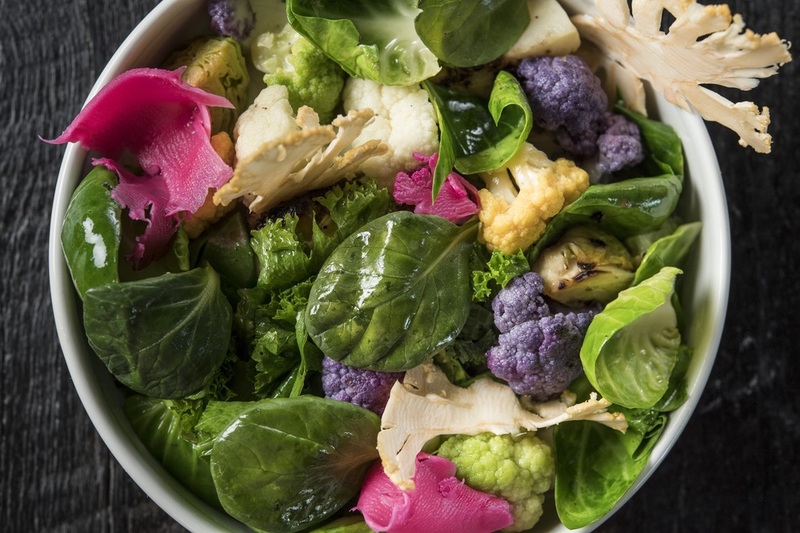 Almost every member of the brassica family is represented in this dish of ricotta dumplings, pickled purple cauliflower, pernod, pak choi, and smoked cabbage broth. Deceptively simple, deeply complex. Every week, in the spring and summer, our forager heads into the fields, woods, and mountains of New York and New Jersey to find the freshest and most unusual wild plants, roots, berries, and mushrooms she can. 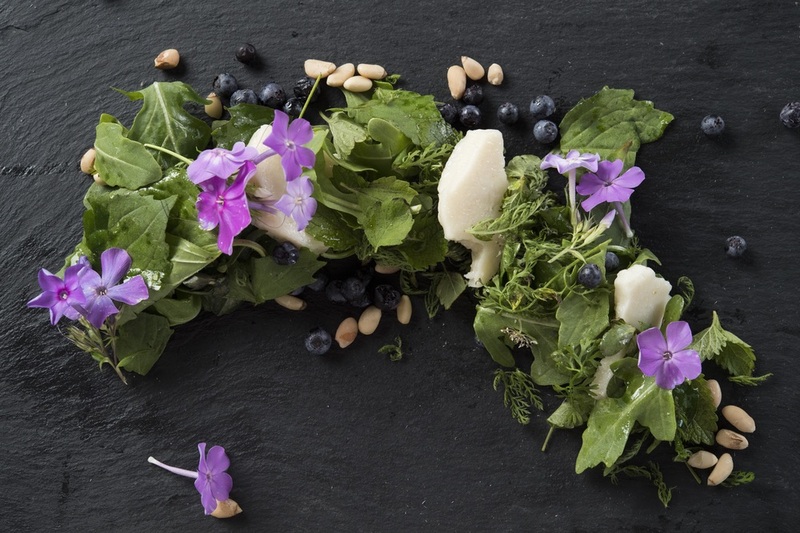 We turn her harvest into one of the most unusual salads you'll ever have, full of surprising flavors like sea rocket, lambsquarters, lemon balm, anise hyssop, and clammy goosefoot. 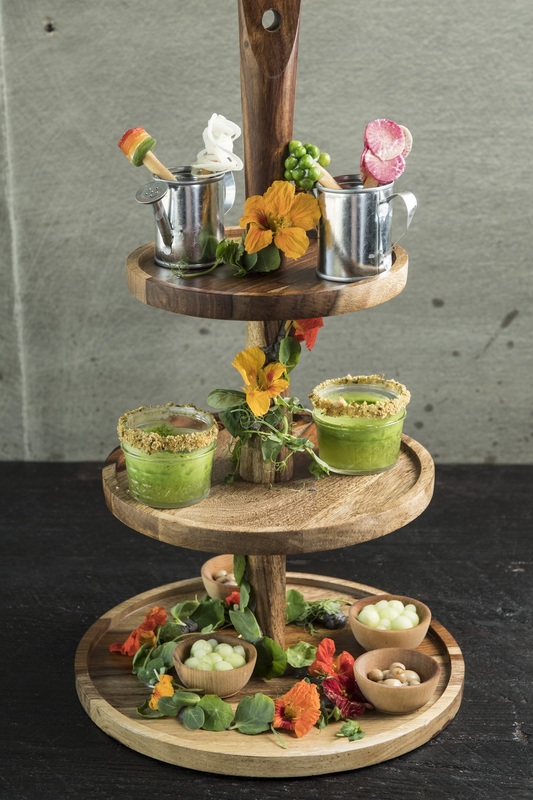 This is Dirt Candy’s version of a salad, deconstructed so that the lettuce is soup, the vegetables are a seasonally rotating assortment of savory bites, the croutons are vegetable Pocky made in house, and the greens are foraged greens and edible flowers. 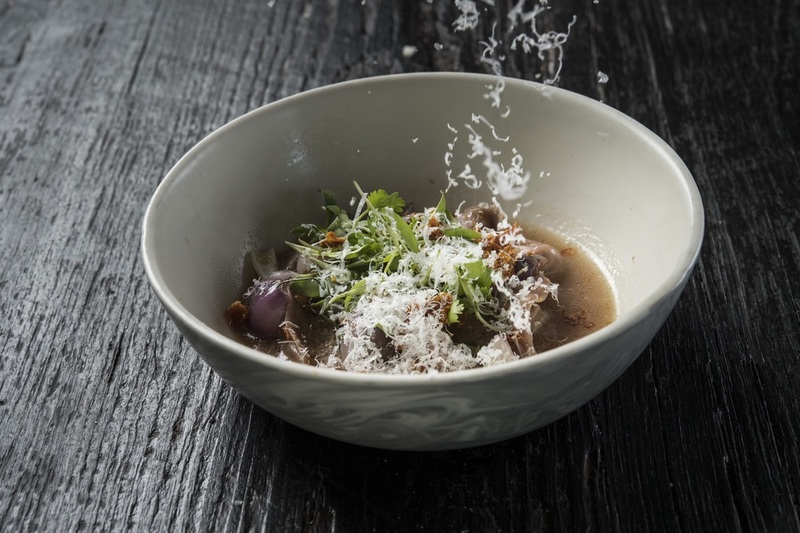 This is our take on an aquachile, a broth with a lot of depth, that we use to cook haricot coco beans, which are the tiniest white beans we could find. It's served with doughnut-cut fresh pepper rings, and tempura fried Sichuan king oyster mushrooms, served alongside cucumbers and avocado. There's a pepper cress salad as well, allowing you to let you taste every different combination of peppers — black peppers, red peppers, yellow peppers, Sichuan peppers, orange peppers, pepper cress, guajillo peppers, ancho peppers — without blowing out your taste buds with heat. Longtime Dirt Candy customers know that when Tomato shows back up on the menu, summer is here. A savory cake made with tomatoes, topped with sliced cherry tomatoes, and tomato pearls, with a layer of smoked feta cheese, the cake is wrapped in a strip of tomato leather we make in house. It comes with a yellow cherry tomato salad and a few bright green drops of fresh summer herb puree. Served with dehydrated zucchini flakes and raw zucchini curls. Sweet and spicy pad thai noodles made from butternut squash, garnished with fermented squash, pumpkin dumplings, tiny lotus roots, and finger limes. Served inside a banana blossom. Kale matzoh balls served in kale galangal broth with stir-fried shisito peppers and red amaranth. Topped with pickled okra seeds, micro cilantro, and a poached egg. Matzoh ball soup is supposed to be comforting, and there's nothing more comforting than a poached egg slowly dissolving into a warm, rich, spicy soup.